Smooth and shiny hair is everybody’s dream. No matter whether you are a man or a woman, you would indeed love moving your fingers through the hair tresses and feel the smoothness. But..but..but, are you frustrated every morning while working through your hair? You cannot get it straight no matter what amount of efforts you put into it? Wait, you are facing a dry hair issue! The best way to address this is to take care of your hair, and there are many ways to take care of your hair. Using a good hair serum is one of those ways. Here is a guide to help you through our top picks, the best hair serum, you can choose for shiny and smooth hair. Like with any other product, you should exercise caution while buying hair serum. Opting for a serum that comes with harmful ingredients may not do more harm than helping you smoothen your dry hair. Take care you ensure that the hair serum that you buy satisfies a few guidelines, or should we say, buying tips. Well, by that we mean what the ingredients that the serum is made. Ensure that the hair serum you buy has silicones as the main component. In addition to smoothening your hair, it has also been found to be capable of protecting and restoring your hair. A few other ingredients that your hair serum should invariably contain include Aloe vera, natural oils and vitamins. If you are looking to buy hair growth serum, then consider having Argan Oil which not only promotes hair growth but also helps you grow healthy thick hair. Please note that the preservatives and alcohol should be a strict No No! The hair serum you are buying should be compatible with your hair type. Not all hair types are equal and similar. It should ideally depend upon the condition of your hair as well. The best hair serum for dry damaged hair are usually the thicker serums, while the weak hair will need lighter options. You would be applying the serum almost on a daily basis. It may not be a good idea to go with stronger aromas. It can indeed create further complications like nausea or headaches. If you are allergic to certain smells and ingredients, it is a great option to skip them. The best trial option is to check it you on your hair for a few hours to get a feel for how you adjust with it. Ideally there isn’t a much difference between hair serum, hair conditioner and hair oil. Several times, all the three are used interchangeably. But let us try to know the differences between the hair serum, hair conditioner and hair oil. Hair Serums come under the hairstyling category. They provide a shine and increase the humidity to make them smoother. Hair serums work as a wrap around your hair strands, thanks to the silicones included. They will help protect your hair from the external damage of any nature and style them up. The hair conditioner are meant for providing moisture to your hair and help them keep hydrated. While the function of protecting outside agents remains similar between a hair serum and hair conditioner, the former will not be able to seep inside the hair strands. The hair oils, on the other hand, are not meant to style your hair. They serve the purpose of nourishing your hair. They are absorbed into your hair and add in fatty acids. You can apply it on any condition of your hair – whether wet, dry or in any condition. Price should never be a measure of quality and it isn’t. Well, it would be a better option to check the product thoroughly if you are buying an expensive serum. In many cases, it may not be worth the extra price that you are paying for it. Having understood the concept of hair serum and things to be considered while choosing the best hair serum in India for your hair, let us now check out a few good hair serums you can buy online. 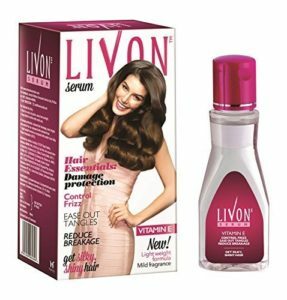 Livon Serum is the best option you can go with if you are looking for the best hair serum for dry and frizzy hair, it is an excellent option to relieve yourself from the hassles of fizzy and dry hair. One of the aspects that should make it a good choice it suits almost all hair types. This hair smoothing serum comes with Vitamin E enrichment that helps you get your hair silky and smooth without making them sticky. 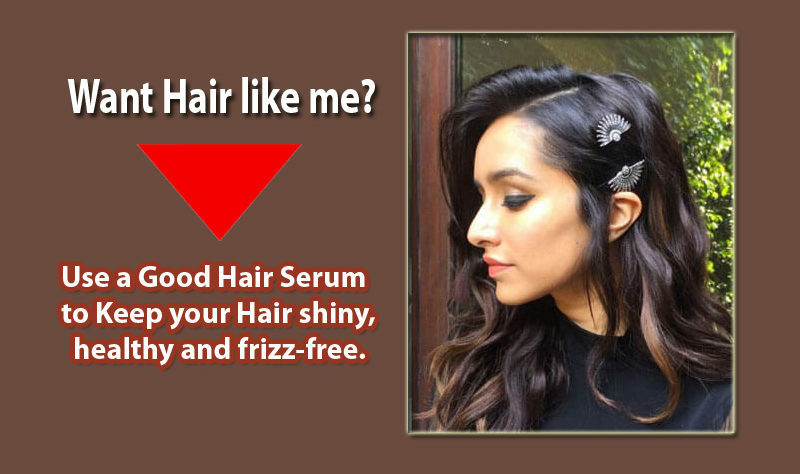 The serum is not sticky and leaves a shine on hair. The advantages associated include its ability to smoothly detangle your hair and the removal of dullness of your hair turning it super smooth. It can also make your split ends non-visible. The serum is available with a mild fragrance, thus can be best suited for the people with allergic reactions too the intense aromas. Damage protection and hair nourishment with vitamin E are a couple of features that we loved with Livon Serum. Q: Can it be used on a daily basis for my dry hair? A: Frequency should not be an issue. You can use it on a daily basis or after every hair wash.
Q: Can I use it after shampooing my hair? A: Yes, it can be used without any issues on a shampooed hair. 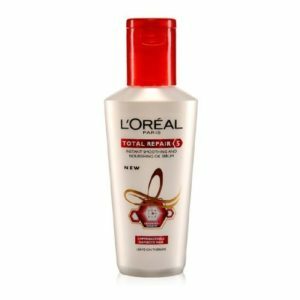 L’Oreal Paris Hair Expertise Total Repair 5 Serum is the best option for those who toil in the sun as part of their day to day activities. The ceramide cement that forms part of the serum helps you repair and protect your damaged hair. It can also be helpful in smoothening your hair and turning it silky smooth. The LÓreal serum takes care of your hair in protecting it from five symbols of hair issues including hair fall, dryness, split ends, roughness and dullness. Although most of the serums do not have any significant side effects, the healthiest route to shine your hair is to eat right, consume plenty of water and get a good sleep! If you are always in the sun, or in case you are regularly exposed to sunlight, water or dust throughout the day, your hair is bound to develop dryness and get rough. 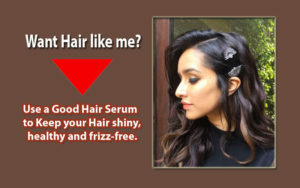 It is quite light on your hair and helps detangles it in an easier manner, making it best hair serum for curly hair too! However, please note that, if you already have damaged hair, the serum may not be able to repair it, though it can protect it from further damage. Q: Is the serum suitable for men? A: Whether you are a man or a woman, the serum should be suitable in either case. Q: Can I use it after hair wash and then dry hair with the dryer? A: Apply it after ~80% of your hair is dried. Once the serum is applied, then wait for ~3 minutes and then you can style your hair. 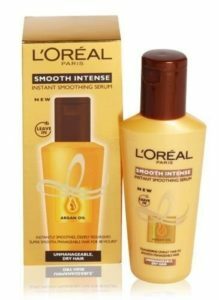 L’Oreal Paris Smooth Intense Instant Smoothing Serum boasts of Argan Oil which has been the best ingredient for hair growth, making it the best hair serum for hair growth in India. The serum has a right combination of silk proteins and argan oil for the excellent nourishment of your hair. The L’Oreal can control frizz in your hair and reduce the split ends. It can also add up shine and smoothness to your dry and rough hair. The product is priced affordably and is completely non-sticky. In fact, the serum can restore the moisture content in your hair so that it will stay safer from the ill effects of sunlight, thereby ensuring that it is smooth and silky. Q: Can it straighten my hair? Q: How to get the best results from this serum? A: To get the best smoothing results, use the serum on towel dried damp hair. To get intense shine and smoothing, apply the serum on completely dry hair. 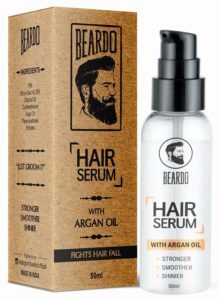 The Beardo Hair Serum With Argan Oil is one of the best options for men’s serum. Of course, the serums mentioned above can be used by both men and women, the aroma can be a concern if you feel it isn’t masculine in nature. The Beardo Hair Serum With Argan Oil adds up healthy and attractive shine to your hair, thanks to the presence of Almond oil and Argan Oil. One of the major advantages of the hair serum is it helps you prevent premature greying of hair. Although this serum is designed to promote beard growth, you can very well use it for your head hair and it can definitely be considered one of the best hair serum for hair growth for men. Q: How to apply it – wet or dry hair? A: Hair serum is usually used on towel dried hair. Q: Does it reduce hair fall? A: Yes, it can reduce your hair fall. Also it has Argan oil, which is necessary for hair growth. Streax Hair Serum has been treated to be one of the excellent choices for men if you are looking for an affordable option under Rs. 200. It is suitable for both men and women and helps you protect your hair from the harmful effects of sunlight. If you are someone who has to work in the sun and exposed to constant sunrays, the Streax hair serum is enriched with the walnut oil. It can help you smoothen the rough hair and can also aid in controlling damaged strands of hair. It can smoothen each of your hair strands without worrying about any adverse effects. Q: Can it straighten curly hair? A: No, it just smoothens your hair. It is not a hair straightener. You can check out the list of 5 best hair straighteners in India. Q: Does it come with any fragrance? A: There isn’t any artificial fragrance added. You will find the natural fragrance due to almond and walnut oils. Well, that was the list of the best hair serums in India that you can try out for strengthening and protecting your hair against the damages like split ends and frizzy hair. Choose the hair smoothening serum that suits your hair. If you are considering buying any hair serum in India than the above 5, then please do name it in the comment below and share your thoughts with us on why do you consider it to be the best hair serum in India for your hair. This articles helped me a lot to choose the correct hair serum for my hair. All these serums are affordable and easily available in pharmacies and online. I was juggling between Streax and Livon serum and I came to the right page. Finally, I go with Streax as it protects hairs from sunlight. I have used Livon serum couple of times and I wanted to try new good serum. Livon did not give me a chance to complain. Thanks for your input on our article about the best hair serums in India. We know that girls are quite particular about choosing anything for hair. That is why we have done our research and listed the best ones. Both Streax and Livon are good. Thanks for the article. It is great and great content with rich information. All the hair serums are easily affordable and available. I will surely share it with my friends.